I wasn't about to post anything on this blog to mark the death of Hajo Herrmann - you can read the usual platitudes elsewhere on the web. I certainly won't be mourning his passing. 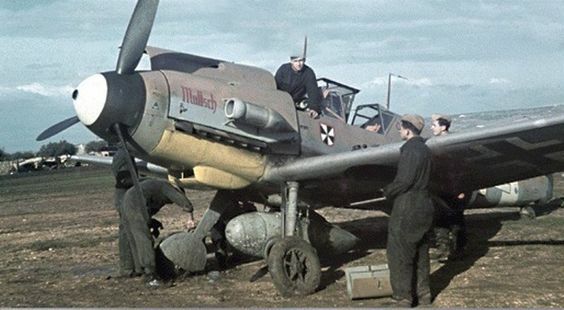 However a couple of points are probably worth making and reiterating in the context of this blog given Herrmann's high profile post-war as one of the highest-ranking Luftwaffe 'survivors' and probably one of the most well-known Luftwaffe pilots of the Second World War. Hans-Joachim ("Hajo") Herrmann, who died on 5 November aged 97, was one of the most 'innovative' air tacticians in the Luftwaffe; he is known above all for the introduction of wilde Sau night-fighting which led to the establishment of Jagdgruppe Herrmann which became JG300, one of the leading homeland air defence fighter wings of the Luftwaffe. While undeniably 'charismatic', he was also undoubtedly what would be described today as a committed Nazi determined to fight to the end whatever the cost. In early 1945 he was the driving force behind the Sonderkommando Elbe, a 'special' unit of fighter pilots tasked with ramming Allied bombers out of the air, drumming up 'volunteers' from among the Luftwaffe's dwindling ranks, deliberately giving the young inexperienced pilots- many from his former fighter wing JG300 - no indication as to the nature of the mission they were to undertake..
Of course there are many who must think that the typical heel-clicking, bemedalled and 'Hitler Gruß'-saluting high ranking Nazi officer as portrayed in films is a Hollywood cliché. Except that in Herrmann's case it would seem that this is apparently what he was and how he conducted himself. Quick to anger, he terrified his subordinates and junior pilots. He was just as quick to come up with schemes that would cost them their lives in defence of the cause. According to an anecdote that author Jean-Yves Lorant did not include in his history of JG300, Bf 109 pilot Lothar Sachs -who lost an eye in combat while flying with JG300- recalled having to report to Herrmann with the Nazi salute on return from a particularly hazardous and nerve-shredding single-engine night fighter sortie - and then being severely reprimanded for having preferred to stay in the Flugleitung on the airfield at Bonn-Hangelar (chatting with the female auxiliaries working there) rather than going straight to bed. Normal military discipline perhaps or an indication of the man's rigidity and inflexible nature? More damningly perhaps, a friend of mine reported that while visiting a graveyard during the course of a JG300 reunion during the 1980's Herrmann had confided that he felt unable to shed any tears for those killed in the conflict. Echoes of 'those who fell in battle were not worthy' to paraphrase a well-known quote? While Herrmann's memoir 'Bewegtes Leben' is a particularly well-written, almost poetic account of his wartime career, even after the war - and ten years in a Soviet prisoner of war camp - according to the Daily Telegraph's obituary he remained 'unbroken' and " never participated in the collective soul-searching about Germany's role in the conflict ". By that time he was a successful lawyer still defending the cause - he specialised in actions involving neo-Nazis and Holocaust deniers, including the British historian David Irving, and was active as a speaker for the far-Right German People's Union (DVU) and the National Democratic Party of Germany (NPD). Worth noting too that leading German newspaper the Frankfurter Allgemeine Zeitung refused to publish a death notice from Herrmann's son Benno as detailed on Benno Herrmann's own website. Monies collected for this purpose were to be returned to contributors.